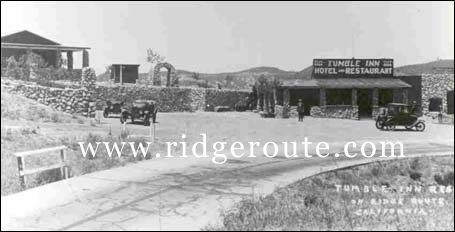 Little is written regarding the Tumble Inn. It was a rock structure housing a Richfield Gas Station, garage and cafe at road level. Cement steps lead to cabin type accommodations and restrooms. It was a small resort with a far-reaching vista. In later years the name was changed to "The Mountain View Lodge." Information is not clear as to when it was constructed or demolished. It does appear on the 1926 Topo map and was listed on a 1928 travel guide. All that remains today is a rock wall and the steps that lead to the upper area.